Very occasionally one has the opportunity to hear an album which has the feeling that it was written and composed with just you in mind, combining so many elements which you hold dear into one glittering gateway through which you wish to slip forever. Whilst the use of ‘tombs’ in the world of metal is hardly an original one, Obsequiae’s Aria Of Vernal Tombs provides a unique and beautiful interpretation of this motif. In this work by the Sequentia of metal, there are no paeans to sadistic death cults, black wisdom or similar tired and well trodden imagery. Instead we are presented with vestiges of fine art, spirit, magic and mystery in uplifting and exquisitely crafted melodies; two are taken from the 13th century Galician Cantigas de Santia Maria (“Ay que por muy gran fremosura” & “Des oge mais quer eu trobar”); one from 12th century trouvère Blondel de Nesle (“L’amour don’t sui espris”); another is an original harp composition based on An Orison to God Almihiti [Almighty]’ (“The Anchoress’ Orison”); and others are a modern, joyous, electric homage to the polyphonic spirit of the Middle Ages; all of which waft out from the verdant mossy sepulchres and chapel ruins to our ears. The first Renaissance occurred within the 12th century, and unlike its successor showcased a sublime melding of the technical, the scientific, with the spiritual, mysterious, theological and artistic. This is the essence of Arias…: there is an intangible joy and magic within the precision of the sound, whose production allows for a crisper and far more layered experience than their tremendous debut. There is a vast array of detail, yet nothing is superfluous or anything other than necessary to conjure the atmosphere. The guitars transform at times from strings into pipes, being more akin to an organ flinging its melodies to the vast arched vaults of a cathedral and then bursting into complex duelling polyphony. This is particularly evident in soaring chords that begin “Pools Of a Vernal Paradise”, which reference the sounds of Celestiial’s glorious Where Life Springs Eternal. During other occasions they wash over the listener like the tides of the sea. The drums provide a solid and flourishing base to underpin each song, ranging from gallop to pounding echoes and effective mid pace thunder. This can be seen in “Anlace and Heart”, an anlace being a 13th century style of tapered dagger, where their shifting rhythms give the impression of a dramatic tale being told. Subtle choral effects soak through the guitars, lifting their melodies to lofty heights and there is an additional use of field recordings and samples, all of which have been artfully invested into the end and beginning of each track and imbue the album as a whole with a cohesive narrative. This is deftly illustrated by final twenty seconds of choir and harmonium in “Autumnal Pyre”, which then segues into one of the most sublime and joyful songs on the album “Until All Ages Fall”, whose deceptively simple main riff is the very sound of the eternity of Western knightly myth, heroism and chivalry on horseback. 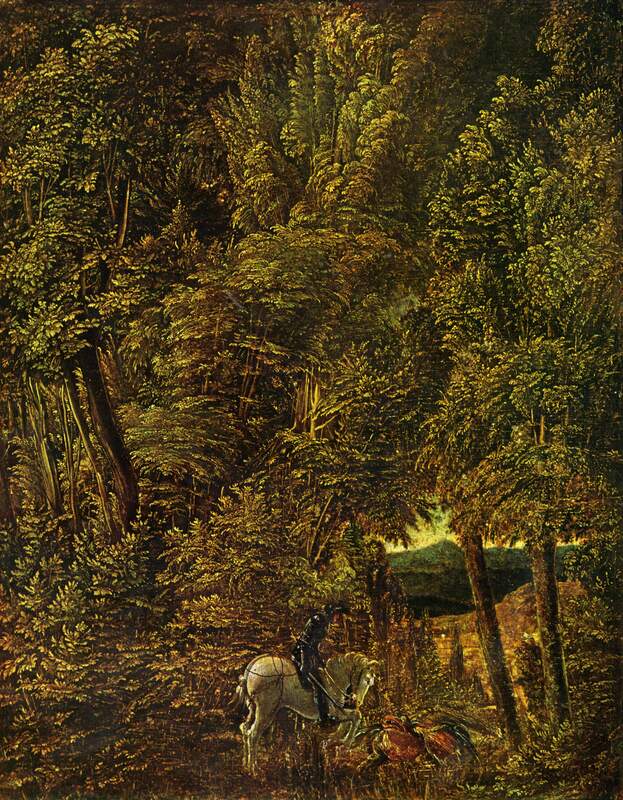 This is the audial equivalent of Albrecht Altdorfer’s painting of St. George, wherein the armoured saint occupies only a tiny fraction of the canvas, the rest being taken up with foliage and great towering tree trunks, that great vernal paradise of the forest. Special mention must be made of the pieces performed by Vicente La Camera Mariño (“Ay que…”, “Des oge…”, “L’amour…” and “The Anchoress’ Orison”), an exceptionally skilled harpist whose work lifts this album from the sublime to the divine. Each of the four recitals provided serve not only to give pause for introspection and quiet reflection, but also to complement the musicianship found in the more bombastic songs on the album: all are different facets of the Medieval atmosphere. Within is found the contemporary crystalline beauty of the trouvères, troubadours and minnesingers, the mysteries of leafy forests and sacred duties, the grandeur of Medieval monuments and the galloping rhythms horseback en route to Montsalvatch. Many groups which claim an inspiration from the Medieval period (beyond referencing it in a song title a la Moonblood), feel it sufficient to throw in a ‘castle-y’ sounding riff, maybe with a church bell jangling in the background, or a synthesised harpsichord and flute intro. None, to my knowledge, have studied polyphony to quite the degree which Obsequiae do, researched and utilised genuine material from the period and invested so much time into ensuring that, even with modern instrumentation, the spirit and essence of early music is thoroughly embedded within their sound and aural aesthetic. One only has to watch some of the recordings of band members playing harps, dulcimers and other instruments reciting pieces from codices and cantigas to see that they know what they are doing. Whilst present on their debut, this essence has been elevated to new heights, wherein the apprentice has truly become a master. Much has been made of the cries from several Cascadian bands who encourage the ‘re-wilding’ of the world through their action and music. This is all very fine, however here we find something even more ambitious and precious: the ‘re-enchanting’ of the world and the imagination. Obsequiae (headed by Tanner Anderson) has proven itself to be the Jacques le Goff of the musical world, delving into the Medieval imagination like none other. In the debut album Suspended in the Brume of Eos, Tanner cries “Take me to the forest!”, which he certainly does in Arias…, but not to the commonplace ‘grim woods’ with lurking internet trolls and tired corpse-painted gremlins leering out half-heartedly from snowy thickets. Obsequiae inhabit a very different verdant and sylvan realm, one whose bestiary is far more fantastical than the ‘legions of doom’ found in so many drab outfits. Tanner, Andrew and Vincente have created a sonic interpretation of Medieval landscapes in their physical, mythological and metaphorical forms, and it is this which we are going to explore with some detail below in the final parts of this review, which is only fair given the sheer amount of work, quality and effort invested in the album’s composition. The forest in the Medieval imagination was both a place filled with spiritual and physical danger, and a blessed shelter in chivalrous Romances, providing encounters with ‘wise men’, sages and hermits. It was the setting for liminal encounters, blurring the real and supernatural, and this idea of encounters with ‘otherworldly’ forces within the forest is a popular aspect of folklore throughout Britain and Europe. Typically seen as ‘opaque’, the forest was able to contain both great and useful reserves of game, honey, timber etc., and also those real and imagined figures at the fringes of society such as seers, witches, devils, thieves, “hunters, charcoal-burners, blacksmiths, honey and wax gatherers, ashmen…and bark pullers.”  The chansons of William of Orange, particularly the “Moniage Guillaume” depict the forest as a nebulous place populated with hermits in “hidden high edges….in the depths of the leafy wood.”  In Béroul’s Tristan, the forest is a refuge, where the protagonist feels as safe as in a castle surrounded by walls and rests with his lover in a cabin amongst the trees, with game and sustenance being abound, and where he has an encounter with a forest dwelling seer. Elements of prophecy, magic and purification through a simple life in the woods are revealed in this text, and in a similar vein Arias… provides us with a respite from the mechanised death of mystery of the modern world. It is this forest, offering succour to the soul starved of romance (I refer here not to that of Valentine but of the literary and artistic style) and beauty, to which we are taken and in which our tired imaginations are re-galvanised. Turning and twisting melodies offer surprise, inspiration and secrecy, as well as rapture and beauty, embodying the multi-faceted relationship of the Medieval mind with the forest. “Wilweorthunga” (Old English for ‘well worship’) references the practise of hydrolatry, which, despite being banned in the 10th century, persists across Europe (and beyond) in the form of tying votive offerings (string, ribbons, snatches of cloth) to trees adjacent to wells and springs. The veneration of watery bodies reaches back to our collective primordial past, and finds great expression from the Neolithic to present day (some famous pre-Christian examples are the votive deposits of weapons in Danish bogs and the fenlands of Norfolk). An example has even been found in a Palaeolithic context near Hamburg, where a dead-ice lake yielded an amber plaque with a hole drilled through it, indicating its use as a talismanic pendant. Springs, pools, lakes and bogs/marshes act as gateways to the otherworld throughout our collective history, both reflecting the sky above and also holding a world within which we, as land dwellers, can never hope to fully explore. These elements of mystery, myth, liminality and magic are channelled through the music to create an atmosphere of otherworldliness, but one which relies of skilled composition and craftsmanship rather than synthesised wind sounds or buzzing space drones. We are taken to the silent pools in carved wells and mossy glades, home to the fantastical beasts of tale and tapestry, whose cool waters have fed the spirit and imagination for centuries. The inclusion of a reference to Orphic rites within the final song may appear to jar with the Medieval aesthetics of the album, but it is in fact a most fitting inclusion. The Medieval literary and theological view of nature stems from two sources which formed the Western European mindset; the Classical and the Hebraic. Through the popular culture of the sermon and the folktale, both shaping the personal response to nature, the non-urban environment represented both a locus amoenus (‘lovely place’, typically a bucolic pastoral landscape) and the locus horribilis (‘terrible place’, wild and barren in character. The concept of locus amoenus was inherited from Greek and Roman pastoral literary traditions (such as Theocritus’ Idylls and Virgil’s Pastorals), containing all that was beautiful, pure, and representative of a paradisiacal state devoid of distractions from spiritual contemplation (thus ideally suited to hermits and religious retreat), although this landscape was not thought of as being beyond improving by man’s efforts. It is this locus amoenus which Obsequiae presents to us rather than the Hebraic locus horribilis (with its broken and barren desert landscapes): a verdant and beautiful realm offering mysteries, supranatural encounters and the melding of folklore and high culture (see “Pools of a Vernal Paradise”). Orpheus was the primary figure of Classical mythology and shrines in Greece containing alleged relics were perceived as oracles and received pilgrims and devotees. This practise of pilgrimage carries over into the Medieval period with a panoply of Christian and Christianised sites in the forms of cathedrals, reliquaries, miracle spots, springs, wells and murky transformed locations (whose guardian had been transformed from sprite to saint). Watery sites in particular saw a curious marriage of Christianised mythology and archaic spiritualism, and whilst the question of direct continuity of practise is difficult to answer, there is no doubt that these transitions held their feet in both worlds. Continuity and innovation, tradition and interpretation, Obsequiae mirrors this process in its music, hymns to the Classical celebration of nature and its mysteries and also to the polyphonies and artistic expressions developed within the Christian Medieval world. With Arias Of Vernal Tombs, we find Obsequiae at their (so far) most celebratory, artful, magical and beautiful, each note bringing the listener back to an age where precision and mystery found harmony in each other, with swirling narratives of legend which stand timeless in their majesty. 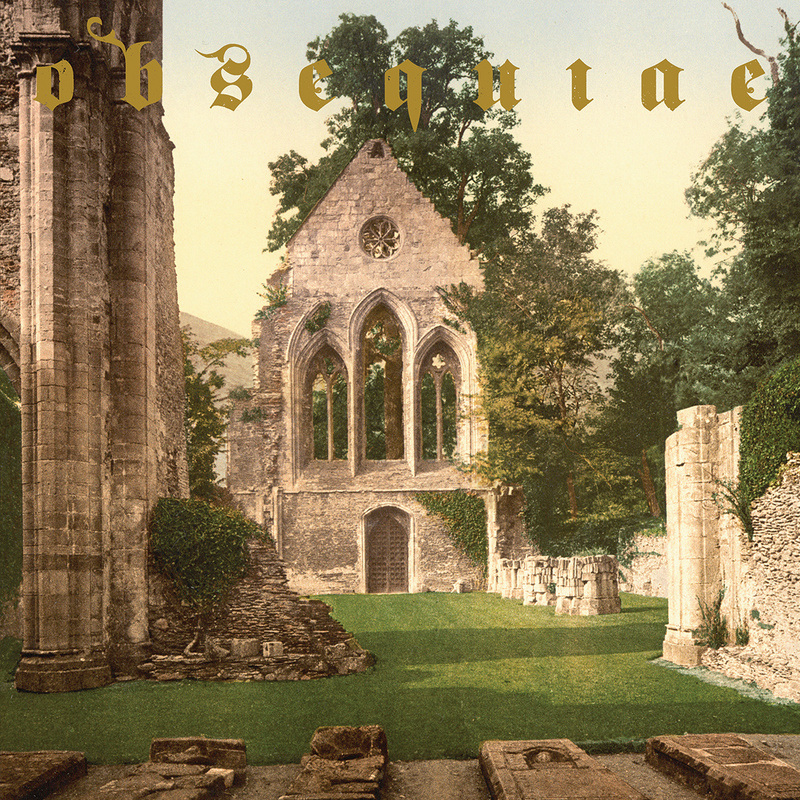 Obsequiae allows the listener to re-enchant the world around them, to see the glistening pools of inspiration that intoxicate the band, and to drink from these sacred waters. From their soft wings, and Flora’s earliest smells. Extract from the second book of Paradise Regain’d by John Milton. Whilst this review is based on the pre-release stream of the album, it is worth mentioning the album artwork itself, as this is an integral aspect of the work. The cover is a hand coloured glass slide depicting the ruins of the nave of Valle Crucis Abbey in northern Wales, and one can rather appropriately see the remains of mossy tombs in the foreground. Within these wall monks once gave hospitality to several important Welsh poets, one of which, Guto’r Glyn, is still buried there, and for a time this abbey was the spiritual centre for the region. These ruins are thereby indicative of the music therein; refined, authentic, poetic, spiritual, majestic and evocative, a perfect visual accompaniment. Credit must be given for this aesthetic choice, rather than some garish renaissance fair visual or similar tripe, as it indicates a sound appreciation for both the power of ruins on our imagination and allows the architecture of the time to speak for itself. Grand Medieval Times – Several reviews on Medieval-themed albums, including Obsequiae‘s Suspended in the Brume of Eos. Taigafolk – A review of the split album Spletenye, which also transports the listener to magical realms. Bloch, M. 1951. Les Caractères Originaus de l’Histoire Rurale Française. Paris: A.Colin. p 6. Le Goff. 1988. p 55. Ray, C. 2014. The Origins of Ireland’s Holy Wells. Oxford: Archaeopress Publications. p 14. Howe, J. 2002. ‘Creating Symbolic Landscapes: Medieval Development of Sacred Space’ in Inventing Medieval Landscapes: Senses of Place in Western Europe. Howe, J and Wolfe, M (eds). Florida: University Press of Florida. p 210 – 212. Unfortunately, this band wasn’t able to go beyond what they already did in their first album. The percussion is disconnected, the ideas are presented in a slightly more ambitious approach that goes beyond the inherent capabilities of this kind of simple and limited medievalesque arrangements. Lovely article, nonetheless. Always a great read. Like most content around here, the write up is much better than the music. I do like it when one of you strikes gold and shows me something that your sense and philosophical minds are better equipped to capture. That is the folk, the spiritual and the simple. That side of metal, ambient and folk will ever remain this website’s area of expertise.